Most people believe that dentures are for old people but that is not the case. Dentures are false teeth that are removable and made from metal, nylon or acrylic. They are meant to fit over the gums in spaces with missing teeth. Missing teeth can leave gaps that can be problematic with speech and eating. The solution offers people a quick, convenient and inexpensive way to replace the missing teeth. Why do people get dentures? There are a variety of reasons why a person might need dentures. Most people get dentures to improve their appearance. People that are missing all their teeth or most of them look older than their age and their faces appear shorter and hollow. Facial muscles tend to sag without teeth hence the older look. The dentures fill in the facial features making a person look younger. There are many reasons why one might be missing most or all their teeth. They could have had their teeth removed because they had extensive cavities, serious gum disease or severe injuries. Some people might be lacking some of their teeth because they did not develop since they have an inherited trait. What is the solution for missing teeth? 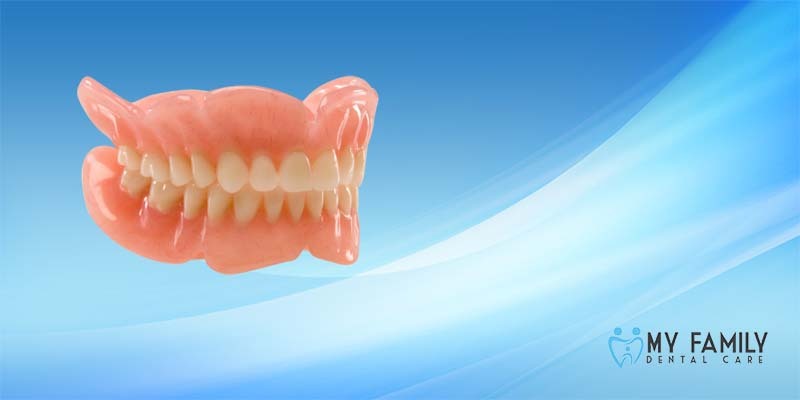 Complete dentures; this are put in place when the full set of teeth are missing. They replace the lower or upper teeth. The dentures will be fitted as soon as your teeth are removed. Occasionally the gums might be given some time to heal before fitting. The denture will fit snugly over the gums and the jawbone. Partial dentures; these are used to fill in the space of a few or just one missing tooth. It is a plate with false teeth attached to it. It clips onto the natural teeth using metal clasps to hold them in place. My Family Dental Care Clinic © 2015 All Rights Reserved.